Inviting someone to a romantic get away should be an equally romantic event. This Valentine's Day ask your partner out with a charming gift they can't say no to. 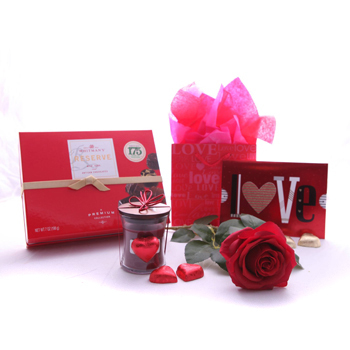 Your recipient will enjoy a single iconic red Long-Stem Rose, a decadent box of Chocolates (150gr), and a romantic red Candle in glass. Ask for an evening together, say I Love You, or set the mood for Valentine's Day with Romantic Accessories.